Nobody can know how big a part altitude played in the Lions’ downfall this summer. But certainly the decision to play Tests in Pretoria and Johannesburg, 6,000ft above sea level, raised a smile in the Springbok camp when the schedule was announced in April last year. The thinner air of the high veldt is great for propelling the ball long distances but can leave an unacclimatised player gasping for breath. The air we breathe at sea level has a saturation level of 20.9% oxygen – this drops the higher you go, so that at the top of Mount Kilimanjaro, for example, it’s only 10.5%. Train at sea level and the oxygen saturation of your blood will drop only a couple of per cent from its usual 96-98%. But train, even at moderate intensity, at altitude and the blood oxygen level drops to 70-80%. Brutal. Happily, there’s a flip side to this, because fitness training at altitude, whether the real thing or a simulated environment, as the Lions did pre-tour, can bring about substantial benefits in terms of enhanced performance and injury rehabilitation. The hypoxia (oxygen starvation) in the muscles stimulates adaptive responses from the body. This allows you to train at a higher intensity and for longer, burning more calories and increasing metabolism. Twenty minutes of hypoxic training equates to about 80 minutes at sea level. An arctic explorer may lose his toes to frostbite but he will rarely lose his life, because the brain tells the under-stress body to pump blood to the vital organs. The same principle applies with hypoxic training: it’s like an internal icing effect and means that when you return to sea level you flush through masses of oxygenated blood, so speeding rehab. Footballer Wayne Rooney shaved three weeks off his rehab time from a broken toe this way. Dave Bell, a strength and conditioning coach who worked with Harlequins and Bristol, recently opened his first performance centre in Manchester (www.performcentre.co.uk). His membership includes Andy Sheridan, who did altitude training there prior to the Lions tour and now plans to ‘top himself up’ on an ongoing basis. 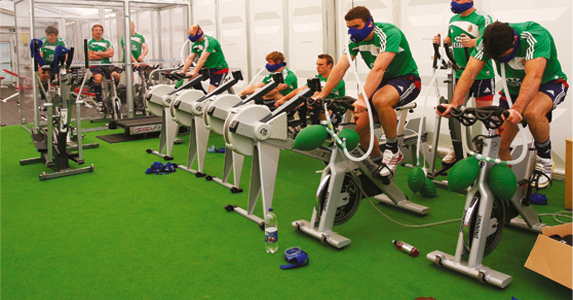 The altitude effect is simulated by using a hypoxic generator, either via a mask or sealed room. The effects of altitude training last for six weeks, so why not give it a go?